At the heart of the Barra's trademark sound is the piano style of Sheumas MacNeil, who along with Jamie Gatti on upright bass, sets the foundation for the band. Together, Sheumas and Jamie have developed into one of the most dynamic rhythm sections in Celtic music. The title of the new album, Racket in the Attic, takes it's name from the live rehearsal sessions held in the months leading up recording. These sessions were held in the attic of Sheumas's house in Sydney Mines, and the repertoire included these three new tunes. The last tune in this medley is by lighthouse keeper Paul Cranford, who has been a regular guest in the MacNeil I household for many years. The Barra's recorded some of his other tunes on The Traditional Album. The new album includes guest performances by Paddy Moloney of the Chieftains and the Newfoundland group Great Big Sea. Fiddler Jerry Holland is recognized as one of the foremost musicians and composers of fiddle music in the world. His fiddle tunes have been adapted for accordion, flute, and many other Celtic instruments, including the highland bagpipe. His fiddle tune "Brenda Stubbert's Reel" was first released in 1982 on the album Master Cape Breton Fiddler. Since that time, the tune has become a popular standard with pipers and pipe bands throughout the world. Jerry continues to compose new music, and this year celebrates the release of his newest book, TheSecond Collection, a collection of fiddle tunes. This track features a medley of tunes from this new book and has been adapted for the bagpipes by John MacLean, one of the leading exponents of Cape Breton dance-style piping. John is the son of Johnny (Washabuck) MacLean, an admired fiddler and step dancer. John was inspired to take up the old-time style of piping through the encouragement of his uncles Alex Cume and Paddy Currie. Rita and Mary Rankin are from the Mabou Coal Mines, an ocean-side community on the western shore of Cape Breton Island. The Mabou Coal Mines are one of the most celebrated communities in Cape Breton traditional music, a community strong in Gaelic song, fiddle, and pipe traditions. Mabou Coal Mines have produced some of Cape Breton's finest fiddlers, pipers, and singers, including Mary "Hughie' MacDonald, one of Cape Breton's most renowned fiddlers of the 20th century. It is from the Mabou Coal Mines Gaelic tradition that Rita and Mary Rankin derive the Gaelic songs in their repertoire. "Buain A 'Choirce" is a love song that originates on the Island of Islay, Scotland. It tells the story of longing for a sweetheart while reaping the oats. The album Home wan produced by CBC producer Glenn Meisner, who has recorded a variety of the Celtic Colours shows for broadcast on the popular CBC radio show Atlantic Airwaves. BIazin Fiddles is comprised of six of the finest young fiddle players from the highlands and islands of Scotland. All of the members are involved in other groups and with their own solo fiddle careers. They first came together as a group for the Highland Festival in Scotland in the summer of 1998. 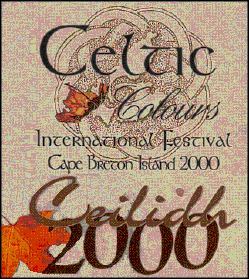 Celtic Colours 2000 will be their second visit to Cape Breton as a group. Following a performance at the 1999 Fiddles of the World Festival in Halifax, they performed as part of a concert series at the Gaelic College, St. Anns, Cape Breton. Fiddler Catriona MacDonald appeared at the 1998 Celtic Colours Festival, and fiddler lain MacFarlane visited Cape Breton several years ago with his father. The new Blaxin Fiddles album was produced by lain MacDonald (a piper and flute player), brother to Allan MacDonald. Allan has taught and performed in Cape Breton and was featured on the second Celtic Colours compilation. Fire On! is a fine collection of traditional tunes, yet includes newly composed tunes by several modern composers, including Cape Breton's Jerry Holland. From the album The Ancient Harp of Scotland. Harpist William Jackson made a brief appearance in Cape Breton in 1983, while touring with the group Ossian. William was a founding member of Ossian, and like the Chieftains, the harp was at the foundation of the ensemble sound of the band. The Harp, or Clarsach, is one of the oldest instruments in the Celtic world. It's origins date to the 10th century, a time when a harpist was honoured above all other musicians. By the 18th century, however, " the Harp had declined in popularity and has sees a revival osiy in recent years. William Jackson has developed a unique career as a solo harpist, producer, and music therapist. He has released several solo albums on the Mill Records label, including a major commission by The Scottish Chamber Orchestra entitled A Scottish Island. William recently directed and performed the music for "Battle of the Clans" for The History Channel. Rory DalI's Sister's Lament" is a lovely air that was previously recorded by Ossian. Vocalist Eleanor Shanley is from Co. Leitrim, Ireland. Members of her mothers family were all fireside singers, and Eleanor grew up surrounded by music. Eleanor was discovered at an informal session by the famed Galway band Dc Dannan, who later invited her to become their singer. Eleanor toured with Dc Dannan for five years, and in 1995, she released her first self-titled solo album, which was produced by Donal Lunny. Sisce that time, Eleanor has toured with Luka Bloom, Sharon Shannon, and Christy Moore. In 1996 Eleanor began work on her second album, Desert Heart, which includes this selection, Galway to Graceland. Since the release of this album, Eleanor has toured extensively throughout Spain, Denmark, and the UK. Eleanor appeared at the 199B Celtic Colours Festival with guitarist John McLoughlin, and during this time, was recorded by CBC Halifax and later broadcast by the Atlantic Airwaves show. Galway to Graceland was composed by the prolific songwriter Richard Thompson, who was a founding member of the highly acclaimed British folk-rock ensemble Fairport Convention. Throughout the history of Celtic music, there have always been crossovers of styles and convergence of players from the different traditions. Dáimh, which means kinship, is a modern example of convergence. Daimh is based on the west coast of Scotland, and this young group brings together players from Ireland, Scotland, Cape Breton. and the U.S. Although they all come from different backgrounds and traditions, they have found common ground in this ensemble. Their new album. Moidart to Mabou, was also produced by piper and flute player lain MacDonald. The repertoire on this album consists of aditional Gaelic songs, traditional fiddle and pipe tunes, and newly composed tunes from Cape Breton composers Jerry Holland. Brenda Stubbert. and Dan R. MacDonald, and Scottish composers Allan MacDonald, lain MacFarlane, and Gordon Duncan. This set includes a popular tune by Brenda Stubbert. Also included in this set is the Cape Breton pipe tune The Scotsville Reel, composed by Allan MacFarlane and published in The Cape Breton Collection (1940). Mulvihill first came to the United States in 1965 when his family emigrated from Limerick to New York. After playing and living in Ireland and England, Brendan now makes his home in Silver Spring, Maryland, and in Limerick, Ireland. Brendan first came to visit Cape Breton in the late 1980s and has been a semi-annual visitor since that time. Brendan is a favorite Irish fiddler of Cape Breton's fiddlers. He is admired for his robust tone and his exquisite bow work. This recording was made by engineer Pierre Sprey in a 100-year-old plantation house in Marlboro, Maryland. Brendan chose these jigs especially for this compilation. The first traditional jig comes from the repertoire of the famous fiddle player and collector Frank McCollam from Ballycastle, Co Antrim, Ireland. The second traditional pg is from multi-instrumentalist Stevie Morris of Douglas Bridge, Co. Tyrone. Ireland. Brendan learned this rare jig while playing with Stevie in the Washington. DC area. Gaelic singer Rod C. MacNeil is from Barra Glen, a tiny community in Victoria County located near lona, Cape Breton. He is the father of traditional piper Paul K. MacNeil, who is also featured on this compilation. The village of lona is known for its rich background in Gaelic songs and strong family connections to the Island of Barra in Scotland. In Barra Glen, Rod C. lives on a secluded homestead and maintains the strong traditions he adopted from his ancestors. He is actively involved in milling frolics and other community Gaelic events. The 1997 Celtic Colours compilation featured Rod C. leading a milling song on a track from the piping album, Open the Door, by Paul MacNeil and Jamie Maclnnes. Rod C. was also featured on the 1998 compilation as a milling chorus singer with Donald MacDonnell. He chose this song especially for this compilation, and he is accompanied by Tracey Dares on piano. The year 2000 has been an exciting one for fiddler Buddy MacMaster. This summer, amid an already busy schedule, Buddy received the prestigious Order of Canada award and released his new album, The Judique Flyer, both in the same week. Although he has taught and performed throughout the world for many years, Buddy still maintains his reputation as a community player. His weekly appearances at the Glencoe Hall dances are legendary. A selection recorded at Glencoe Hall with Buddy and Natalie MacMaster was released on last years Celtic Colours compilation. The year 2000 has also been a busy year for piano player Mary Jessie MacDonald, who Joins Buddy on this track Mary Jessie was a featured accompanist to Dave Macisaac during last year's festival and on the Celtic Colours compilation entitled Forgotten Roots. Since then, Mary Jessie has kept up a busy schedule, including a performance with Dave Macisaac at the Montreal Celtic Festival. This spring, Mary Jessie performed an part of the Symphony Nova Scotia series 'i Halifax, which included fiddlers Howie MacDonald, Carl MacKenzie, and Buddy MacMaster. This track was recorded in Halifax during that time. From the 1930s to the late 1950s, the radio played a powerful force in the promotion of Cape Breton style fiddle music throughout Atlantic Canada. Nightly live broadcasts from Sydney featured Bill Lamey, Joe Maclean, Teria Campell, Angus Chishoim, Johnny Wilmot, and Winston Fitzgerald These broadcasts brought Cape Breton fiddle music to listeners throughout Prince Edward Island, the Magdalen Islands, and all the way to the Gaspé Peninsula of Quebec. On Prince Edward Island today, fiddle players have absorbed much of the Cape Breton repertoire. Throughout the island, this Cape Breton music is blended with the existing regional repertoiren. Souris is on the eastern end of Prince Edward Island and home to the Chaisson family and Celtic Tide. For this track, the band chose a set of tunes composed within the Chaisson family Their new album, Kindle, was produced by bass player Ed Woodsworth, who made a guest appearance with Slàinte Mhath on last year's Celtic Colours compilation. Piano player Doug MacPhee has been featured at all three Celtic Colours festivals as an accompanist and as a soloist in the annual piano summit. This year, Dougie has been touring and recording with David Greenberg and was recently the featured accompanist at the launching of Bill Lamey's CD in Boston. When Doug was growing up in New Waterford, his home was guest to many of Cape Breton's finest fiddlers, who would drop in to play with his mother, piano player Margaret MacPhee. Duncan MacQuarrie was one of these fiddlers. Duncan was from Glenora Falls, and he moved to New Waterford in 1919 Throughout his career as a fiddler Duncan wan a frequent visitor to Doug and Margaret's household. This track is a medley of tunes that were often played by Duncan, and includes a tune that Dan R. MacDonald composed for Neil MacDonald of Detroit (Neil R's daughter Joan MacDonald Boes, was a well-known piano player and composer) This track was recorded in Doug s home in New Waterford Cape Breton. This young Irish group is based in Co. Waterford Ireland Waterford has ancient ties with both Newfoundland and Cape Breton Many of Cape Breton earliest Irish settlers came from thin county. This track is from their debut recording. The fiddler in the group is now Jesse Smith, and he is from Baltimore and for many years was a student of fiddler Brendan Mulvihill. Although a fairly new group, Dansi has already established a trademark instrumental sound. highlighted by intricate arrangements of traditional tunes and the exceptional bodhran playing of Donnchadh Gough. One of the most outstanding members of the newest lineup of the group is vocalist Ciarasi Gealbháin. His renditions of Irish Gaelic and English songs are stunning, and he is considered one of the great new voices of Irish music. This track includes the slide Scarta Glen Slides are popular throughout the southern counties of Kerry, Cork, and Waterford and can be hoard today in Newfoundland. Last year's Celtic Colours compilation featured music from Orkney, a cluster of islands north of Scotland. Further north again are the islands known as the Shetland Islands and home to a culture that, like Orkney, is a unique mixture of Celtic and Norse influences. Here, the music has the influence from the Northeastern part of Scotland, yet the music is spoken with a Nordic sounding accent. A strong local composing tradition keeps the music alive in Shetland, home to The Shetland Folk Festival, one of the most unique folk festivals in the world. "FiIska" is an old Shetland word that means mischievous and high spirited. Filska is a group that represents the young generation of Shetland fiddlers. a tradition that is alive and well today. The fiddlers were allwinners of Young Fiddler of the Year' awards held in Shetland. Their repertoire is a mixture of Shetland tunes, traditional Scottish tunes. and new tunes from composers Phil Cunningham, Jerry Holland, Dan R. MacDonald, and Brenda Stubbert. The islands known as The Hebrides are a duster of islands located on the west coast of Scotland. Many of Scotland's finest Gaelic singers are from these islands The Hebrides have strong ancestral ties with Cape Breton's North Shore and are rich in Gaelic culture. Alyth MacCormack is from the Island of Lewis, an island in The Outer Hebrides. She grew up immersed in the Gaelic culture and later studied music in Edinburgh and Glasgow. After graduating with a degree in music performance, Alyth began to develop the style of Gaelic music she performs today. Since then, Alyth has performed this music at several prominent European festivals, and in 1998, she was a featured performer on the widely acclaimed CBC Halifax television special entitled Celtic Electric. A Fhieasgaich Oig is a happy love song that refers to the Isle of Mull, another Hebndean island. Alyth is accompanied on this tracts by Davey Trouton on piano and fiddler Aidan O' Rourke, a member of Blazin' Fiddles. One of the most memorable events of the 1993 Cape Breton Music Festival in Cork, Ireland, was the performance of Irish fiddler Sean McGuire. Sean's style and technique have been well admired by Cape Breton fiddlers for many years After his concert, Sean performed privately for all the Cape Breton fiddlers in a small backroom session at Cork City Hall. He played Dwayne Cotes fiddle and was accompanied by Dave Macisaac on guitar. This session was one of the greatest performances of his long career. He was later joined in that session by Frankie Gavin, Donal Lunny, and Martin O'Conner. Sean was born in Belfast, Ireland, in 1927. He is the son of Co Cavan, whistle player Johnny McGuire. Sean was classically trained on the violin. He went on to apply this training to traditional music throughout his career as a folk violinist. Today, Sean McGuire is a fiddlers fiddler,~ known around the world for his trademark variations on traditional tunes such as on this selection, 'The Masons Apron,' the definitive version. Singer Buddy MacDonald is from North Shore, St. Ann's Bay, Cape Breton. His father, Tom Angus, was known in his community as Tommy Peggy MacDonald, a member of The North Shore Gaelic Singers. Tommy Peggy was recorded throughout the 1950s and 60s by various folklorists, including Ralph Rinzler. (A collection of Ralph Rinzlers Gaelic recordings from Cape Breton will be published early next year by the Smithsonian/Folkways label) It was Ralph Ririzler who brought Tommy Peggy and The North Shore Gaelic Singers to the Newport Folk Festival in 1965. At this now-famous event, these tall Gaelic men mingled with the likes of Bob Dylan, Joan Baez, and Donovan, heros of the 1960s folk music revival It was from this folk music revival that a young Buddy MacDonald took his inspiration as a singer. Today, Buddy is well known for his ballads and songs and his unique North Shore accent. On this selection, the two worlds that first met on the Newport stage in 1965 merge again with this unique blending of Gaelic and English verses. Community piper Paul K. MacNeil is from Barra Glen, a small neighbouring glen to the village of lana in Victoria County, Cape Breton Island. Piano player and step dancer Tracey Dares is from Marion Bridge, Cape Breton County. Paul was featured on the first Celtic Colours compilation, along with piper Jamie Maclnnes. This selection was from their highly-acclaimed album entitled Open the Door. Tracey was also featured on the first Celtic Colours compilation as an accompanist to fiddler Natalie MacMaster and on the second compilation as the accompanist to Buddy MacMaster. Paul and Tracey are now married and make their home in Castle Bay on the ancestral homestead of Paul's father, Rod C. MacNeil Their new album, entitled castlebaymunic.com, features a wide selection of traditional and newly- composed selections. The unique sound you hear in the result of this track being recorded in Paul and Tracey's old house, enriched by local hardwoods and wide pine-board wall paneling. Paul composed this beautiful air for Alex John J Maclean, a local carpenter and community character.